Join Joy (Gongs of Joy) and A.Michelle (Drumsong) to experience the resonant vibrations of the gongs, Tibetan and crystal singing bowls, drums, flutes, and other sound healing instruments! Buddhist monks have long employed the vibrations of gongs and brass singing bowls for meditation. Listeners harmonize with a state of un-attachment….of letting go….to flow beyond resistance into persistent peace. Come and clear out the negativity, de-stress and find your bliss! Bring a mat/pillow/blanket to be comfortable lying on the floor, or a comfortable folding chair if you’d rather sit. Fee: $25 pre-registered / $30 at the door. To pre-register, call 401-305-3585 or email Marie@its-my-health.com. 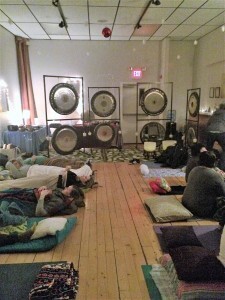 For more information about the workshop, contact Joy at 401-258-3952 or email Joy@GongsOfJoy.com.